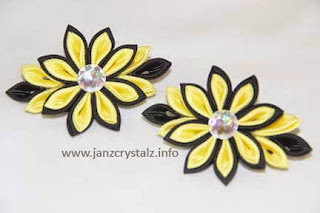 I spotted a set of Kanzashi flower hair accessories from an online shop. I was so tempted to get a set for my little girl to pair her BEE-theme outfit, but opted not. Instead, I bought yards gross grain ribbons from Michelle’s and made the flowers myself. I was intrigued why the flowers were called Kanzashi, and how these intricate flowers are done. The way I understand based on the written information in the internet, Kanzashi are hair decorations used on traditional Japanese hairstyle which go back 3000 years ago. The stick pins were believed could ward off evil spirits. Tsumami Kanzashi on the other hand, is a type of kanzashi that means folded hair flowers or ornaments that are made of fabric. Originally, tsumami kanzashi are made of silk fabric, folded and formed into flower petals. I’m still in the process of intensive researching and reading to understand the term more. Meanwhile, I made a tsumami kanzashi based on the tutorial I’ve seen in the YouTube. Difficult it may seem but in the end, I was able to follow and made my first ever pair tsumami kansazhi hair clips for my birthday girl using lemon yellow and black grosgrain ribbons. I used a sew-on button rhinestone that I bought in a local store as centerpieces. Congratulations for successfully making your first ever tsumami kansazhi hair clips! I really admire your talent for the arts and crafts. Maybe, once I am blessed with a baby girl, I'll be able to have that motivation (or courage) to try doing DIY stuff though Youtube tutorial. Thanks for sharing! Soo pretty! Nothing perks you up like a touch of yellow, right? Post pics of the bee-girl and her bday soon! that is good work. I would love to try my hands on DIY hair acessories. 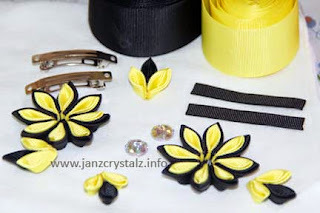 Wow you know how to make Kanzashi's too??! I hoarded a lot of photos of these last year vowing to make one for myself but alas I never made a single one. Keep up the art sis!